by food and beverage journalist Matt Russell! 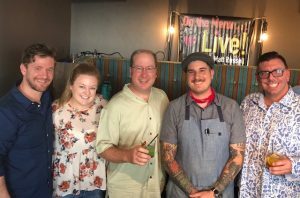 This weekend’s show was a nod to some of the people and places that make summer in Tucson worth sticking around for, and we came to you live from Commoner & Co. on Sunrise Drive! Our celebrity co-host was certified chef and host of the Sports Exchange on ESPN Tucson, Tom Lapadat, who discussed his passion for food and sports and where they intersect. We also caught up with Jane McCollum of Main Gate Square who dished out the latest on the upcoming Main Gate Square Culinary Challenge! Commoner & Co. general manager Kim Keyser then commenced the shaking and stirring with an introduction to her summer cocktail line-up. Fresh, floral, and fragrant! We were also privileged to sit down with the new executive chef at Commoner & Co., Kyle Nottingham, who shared a little about his journey, his approach to rustic American cuisine, and his new summer menu. 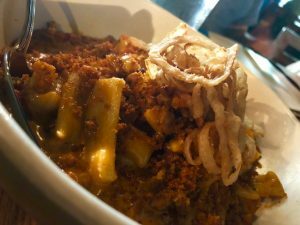 Chorizo mac and cheese with house-made mac, five-cheese bechamel, chorizo, crispy shallots and chile bread crumbs. Yes. Our tasting included a rather rustic range of dishes, including chorizo mac and cheese with a five-cheese bechamel, trout on cous cous with a blistered grape and parsley salad, and roasted chicken thigh with fettuccini and a tomato and caper sauce. We closed out the show with Commoner & Co. / Prep & Pastry owner Nathan Ares who shared some delicious updates from Prep. Check out my bi-weekly culinary and cocktail columns in Inside Tucson Business! Listen for my culinary and cocktail reports every Friday at 12:50 pm on the Bill Buckmaster Show! Tales of the Keg on ESPN Tucson!